Preheat the oven to 350°F. Grease and flour a 13x9 pan. Set aside. In the bowl of a stand mixer, combine the butter and sugar. Mix on medium speed for 2-3 minutes, until well combined. With the mixer running on low speed, add the flour mixture a little at a time, until incorporated. Add the candy coated chocolate pieces, and mix briefly to combine. Spread the batter out in the prepared pan, using a spatula to press it from end to end and into the corners. Allow the blondies to cool completely, and then cut them into 16 pieces. Transfer the blondies to a wire rack, set on a foil-lined baking sheet, leaving about 1/2 inch between the blondies. Frost with the Powdered Sugar Icing. Use food coloring to tint the icing in desired hues, then drizzle it on. Allow the icing to harden before serving. Around the virtual watercooler at Tablespoon, we think a lot about rainbows. Double rainbows, actually, because we know how much you all love rainbows (my best friend does too!). So, we are actually thinking up new, fun recipes that incorporate rainbows. Here’s my latest: Double Rainbow Blondies. These are buttery, soft blondies with rainbow-hued candy coated chocolate pieces inside. They are topped with Powdered Sugar Icing that I tinted with gel food coloring. My daughter was so excited when she saw all the little bowls of icing in all different colors waiting to be drizzled. Me? I wasn’t so excited that I forgot to wear protective gloves before handling said food coloring – who wants to have red fingers for days?!? So, take that as a cautionary tale and use gloves! Now, the secret to making these without making a huge mess? Once you’ve cut the blondies, transfer them to a wire cooling rack that’s set over a foil-lined baking sheet. The foil will fold up easily for mess-free cleanup. 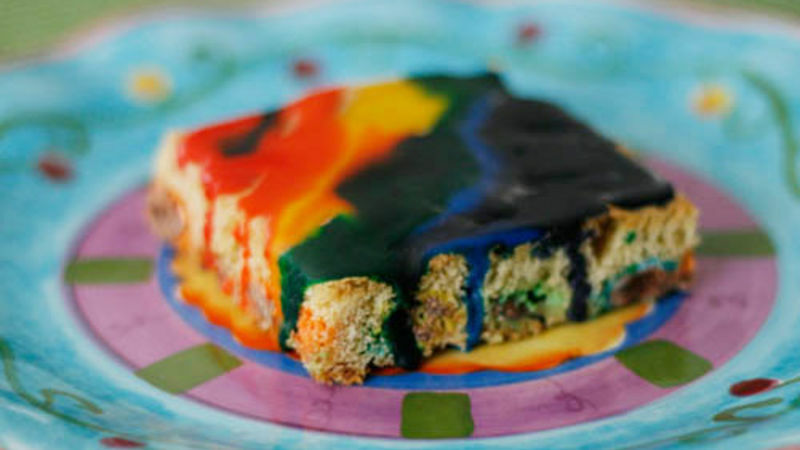 Then you are free to drizzle all the colors without worrying about getting the icing everywhere. Also, leave the blondies on that rack until the icing dries. The best part of these blondies? The wow factor when everyone sees the bright hues.